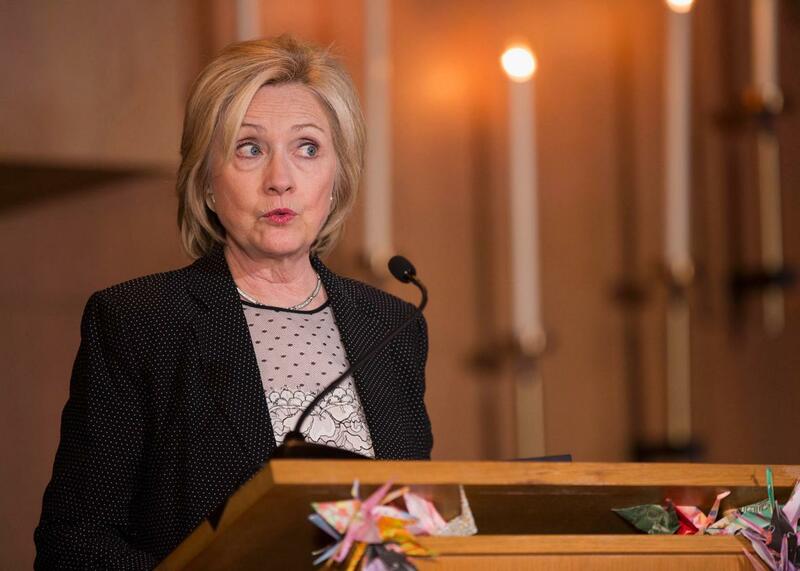 Hillary Clinton speaks to supporters on June 23, 2015 at Christ the King United Church of Christ in Florissant, Missouri. Clinton’s visit to the St. Louis suburb neighboring Ferguson, Missouri focused on racial issues. Hillary Clinton may be hoping to make climate change a winning issue in the general election, but it appears as though Team Green is unwilling to let her coast through the primary without facing some tough questions first. Clinton, who has spent the bulk of her campaign events fielding questions from pre-screened voters, appeared to get caught flat-footed. “No, no it is not,” she replied before launching into an inelegant response that suggested it was naïve to call for an end to drilling without a comprehensive energy plan that “doesn’t disrupt our economy.” Before Clinton was completely done talking, a third attendee stood up and, after shouting something inaudible, began the climate chant. As the video illustrates, Clinton has her work cut out for her if she wants to win over climate hawks who have long been skeptical of her environmental bona fides. To date, her climate pitch has basically amounted to a promise to continue President Obama’s climate agenda. But while the climate crowd has applauded the president’s carbon rules that look to curb fossil fuel demand, they’ve been less than pleased with his decision to expand supply by giving the federal greenlight to energy companies to mine for coal and drill for oil on public lands. As I explained Wednesday, though, the unfortunate reality for climate activists is that Hillary doesn’t need to be overly concerned about them in the primary, since she doesn’t have to worry about them in the general election. Their legitimate fears about what a climate science–denying Republican president would do will be a much greater motivating force on Election Day than their doubts about Clinton ever could be. Hillary knows this, and that’s one big reason for her more moderate, let’s-not-move-too-fast position. Thursday’s town hall, however, suggests that the climate crowd might not sit by quietly as Clinton says the country can’t curb domestic drilling until it has a new, comprehensive green energy policy in place, while at the same time she remains frustratingly vague on what such a policy would look like.